FACT: one of the best smells in the entire world is candied nuts. The trifecta of vanilla, cinnamon & sugar is the epitome of warm & cozy scents. It has a way of melting away stress and brightening your mood all at once. Back in my UMKC days, I used to wear a perfume called Pink Sugar. It smelled exactly like the candied almonds sold at my local mall. Whenever I came into work wearing it (I served at a bar & grill), several co-workers and customers would approach me to get a bigger whiff, ask me what I was wearing, and tell me I smelled like the almonds at Oak Park Mall (essentially a sweetish vanilla). I found this amusing, but quickly realized the benefit of wearing the perfume: it relaxed the folks who smelled it and typically put a smile on their face. That's a recipe for a good work environment, right? These days I avoid artificial fragrance and instead use essential oils for a natural perfume. One of my favorites is a blend called Stress Away because it contains vanilla essential oil. It's one of the secret sauces to relaxation. However, if you don't have essential oils on hand, the next best thing is to whip out your vanilla extract and make some candied nuts! That and homemade banana bread. Mmmm. 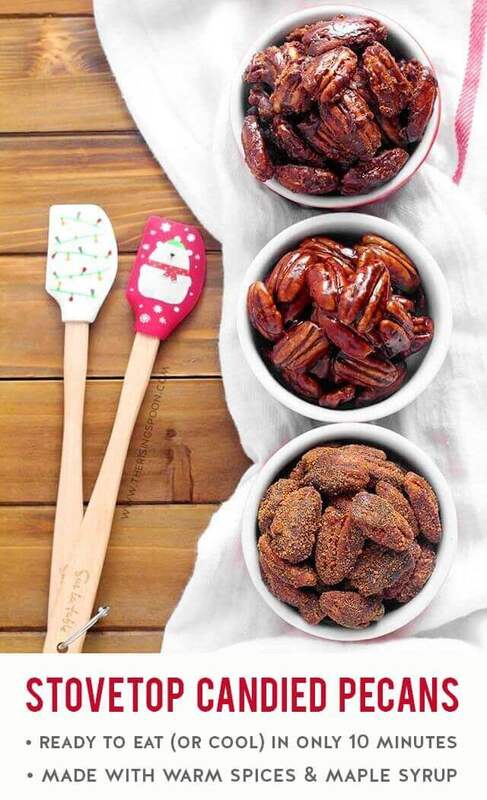 Why Make Candied Nuts On The Stove Instead of In The Oven? And Why Use Butter Instead of Egg Whites? 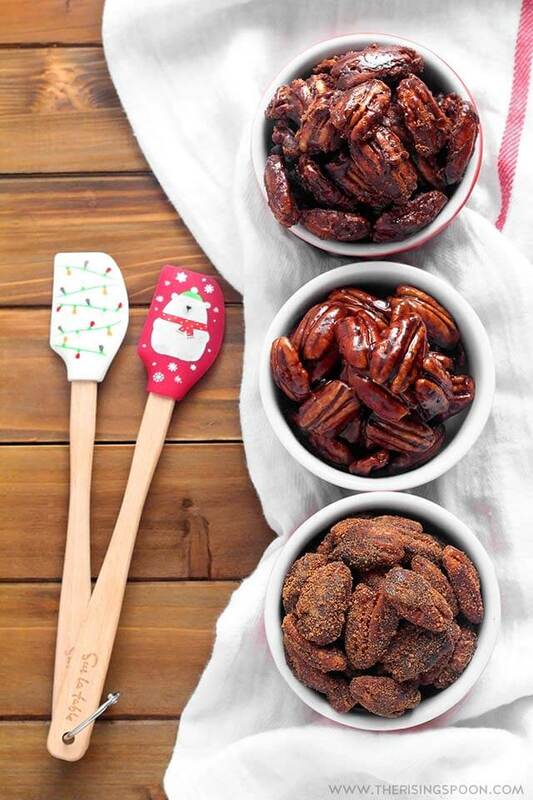 It's super easy to make homemade candied nuts on the stove. But equally easy to bake them in the oven. So, why choose one cooking method or ingredient over the other? Let's explore the differences. Cook Time: The stovetop is faster, doesn't take up valuable oven space (important during holidays), and keeps the house cool (good in the summer months). The oven method is good for when you have extra time or want to warm up the house. Recipe Ingredients: Many oven recipes call for egg whites while the stovetop recipes call for butter (there are exceptions, of course). If you're avoiding one of those ingredients, that will impact which recipe and/or technique you try. Those ingredients also affect the final texture of the candied nuts (see bullet below). Texture: Candied nuts made on the stove with a fat like butter have an exterior coating that is glossy and slightly sticky like caramel. Because of the caramel-like coating, these have a shorter shelf life (the nut itself stays good for several weeks but the outside will start to crystallize after 4-5 days). 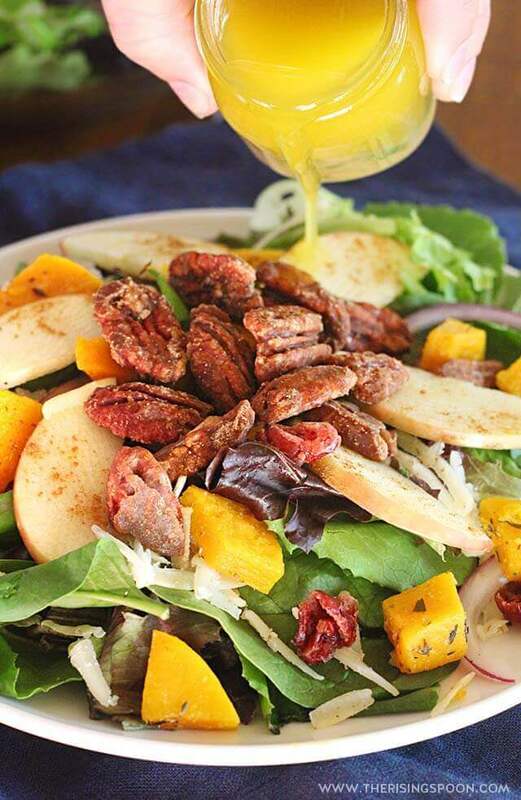 Conversely, recipes with egg whites and no fat create candied nuts with a crunchy coating. These have a longer shelf life because the coating stays crunchy (they always get eaten within 1-2 weeks so I'm not sure how long they keep their crunch). Can I Get a Crunchy Coating Using Butter? It's possible to get a crunchy coating using the stovetop/butter recipe BUT it requires evaporating all the water in the mixture (yes there is water in butter) and bringing the mixture up to a high enough temperature (most likely the soft crack stage on a candy thermometer - I don't know the exact temp for certain because I didn't use one). However, I've only achieved this once (see the salad pic below for illustration). It was in Breckenridge, Colorado on a gas stove. So I was in a very dry, high altitude climate using a stove that heated well. When I tried the recipe again (many times over) at normal altitude in Kansas City (on an electric stove) and at home in Texas (on a glass stove) the candied nuts always came out glossy & caramel-like, not crunchy. It may be possible to harden the caramel-like coating by popping the nuts into a 300-350 degree oven for a few minutes, but I haven't tried that yet. I'll update the post once I get a chance to do this (and to try it with paleo/dairy-free ingredients like ghee or coconut oil). In the meantime, I suggest you try my recipe as written and enjoy the glossy, buttery, slightly stickier exterior. Both versions taste equally good! 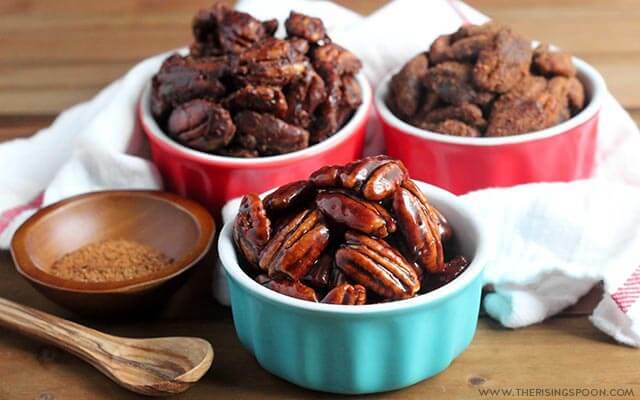 Why Use Maple Syrup & Coconut Sugar For Candied Pecans? Maple syrup is my absolute favorite sweetener, followed by raw honey and coconut sugar. I take every opportunity to use those three over other sugars. I actually used to hate coconut sugar until I tried this brand. Now I like it. Go figure! I decided to use half real maple syrup and half coconut sugar so I could get the deep molasses flavor from both sweeteners while also cutting down the amount of syrup used since it's more expensive. Coconut sugar is also lower on the glycemic scale (it has 4 grams of sugar per teaspoon versus 4.5 in maple syrup and brown sugar) so cutting it with maple syrup ensured it had enough sweetness. I mean, this is candied nuts after all! 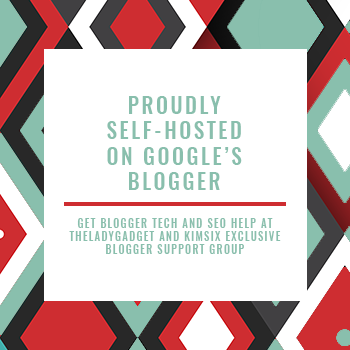 If you don't have any maple syrup and/or coconut sugar on hand you can certainly substitute other granular sweeteners like maple sugar, sucanat, turbinado, brown sugar or cane sugar. However, keep in mind that moisture levels affect candy making so when you switch up ingredients, it may impact the final texture or cook time. EXTRA COATING (OPTIONAL): And if you find that the candied pecans aren't sweet enough for your taste, I've provided an option for tossing them in more granulated sweetener + cinnamon. You can do this immediately (straight out of the hot skillet) OR wait a bit for the coating to solidify on the baking sheet. Tossing them immediately creates a rougher, craggier coating and waiting until the maple coating is cool first creates a uniform sugar coating. See my picture below for a visual example. I'm going to assume you're a skimmer like most folks today. 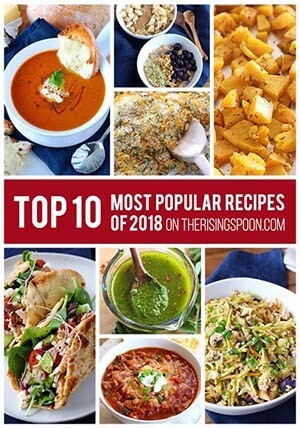 You might even skip right to the recipe, speed read it for the general ideas, then attempt to make it with only a glance or two at the ingredients. I'm guilty of this! This is not a recipe where you can add one ingredient at a time to the skillet with pauses to rummage for containers in your pantry. The sugar coating comes together in minutes, so you need to measure out all your ingredients first and keep them next to you at the stove so there are no mistakes or distractions. Once you pour all the ingredients (nuts, spices, sugars) into the skillet, do not walk away. Everything comes together in only 5-7 minutes. If you try to multi-task, you risk burning the nuts/sugars or having the butter & sugars separate or other weirdness. You might be tempted to turn the heat up to medium-high or high to speed up the process. DO NOT do this. You risk burning the sugars and/or nuts. Medium is as high as you should go, even if your skillet/stove takes a few extra minutes to finish the process! Just like with homemade toffee, the butter-sugar-spice coating quickly solidifies as it cools, so it's important to immediately wash or soak anything that the cooked sugars touched. Skillet, bowls, measuring cups, utensils etc. 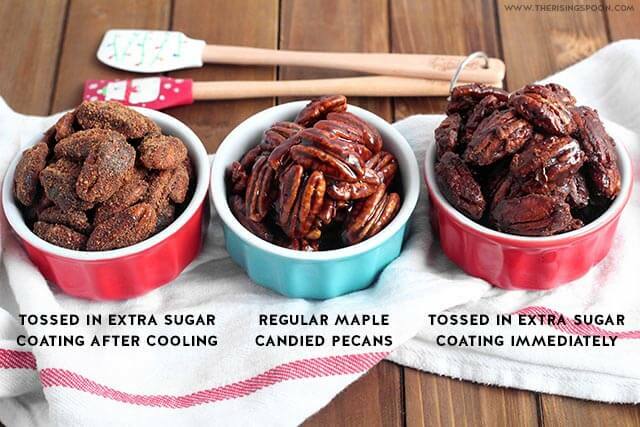 Do this right after you spread the nuts out to cool and you will thank me! The exception, of course, is a cast-iron skillet. Don't ever soak that in water. Instead, clean it while it's still warm, dry thoroughly, and set aside. 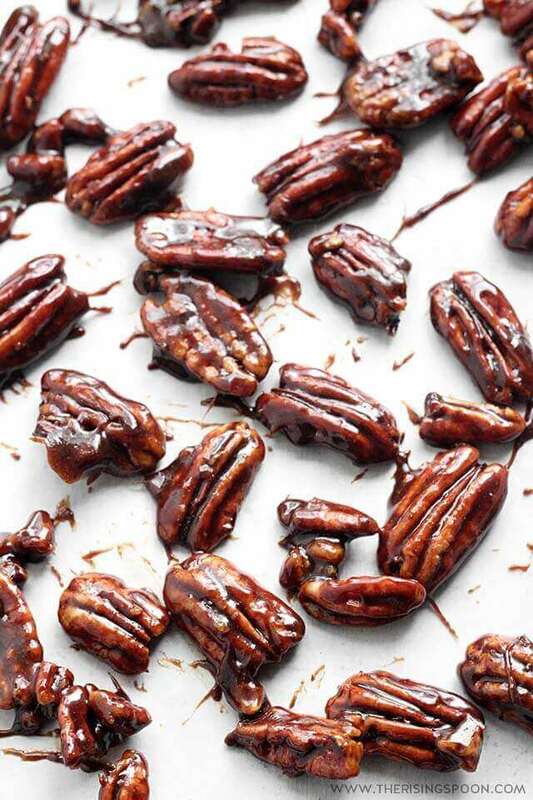 Can These Candied Pecans Be Made Ahead of Time For Homemade Food Gifts? In terms of shelf life, yes. BUT this particular recipe creates a glossy, slightly sticky, caramel-like coating. I've found that by day 4-5 the coating starts to crystallize. It still tastes delicious and will last a few weeks, but the texture is different (and not as good in my opinion). So, if you want to maintain the smooth, glossy, caramelly texture AND give this as a homemade food gift, I recommend making it the day of or the day before you plan on gifting the food. If you need to make your food gifts way ahead of time (like say 7-10 days), candied nuts cooked in the oven with egg whites instead of butter is a better option. This creates a consistently crunchy coating that will hold it's texture. Combine all ingredients except for the butter in a medium bowl and place it next to the stove. Line a large baking sheet with parchment paper and set aside. Melt the butter in a non-stick skillet set to medium heat (should take 1-2 minutes). Dump the contents of the bowl into the skillet and stir everything well (scrape out any excess spices or syrup with your spatula so it all goes in). Cook for 5-7 minutes, stirring constantly with a spatula (don't walk away from the stove). You want the coconut sugar to dissolve in the maple syrup & butter (this happens quickly) and the sugar/butter/spice mixture to reduce & thicken so it's coating the pecans (not the bottom of the pan). 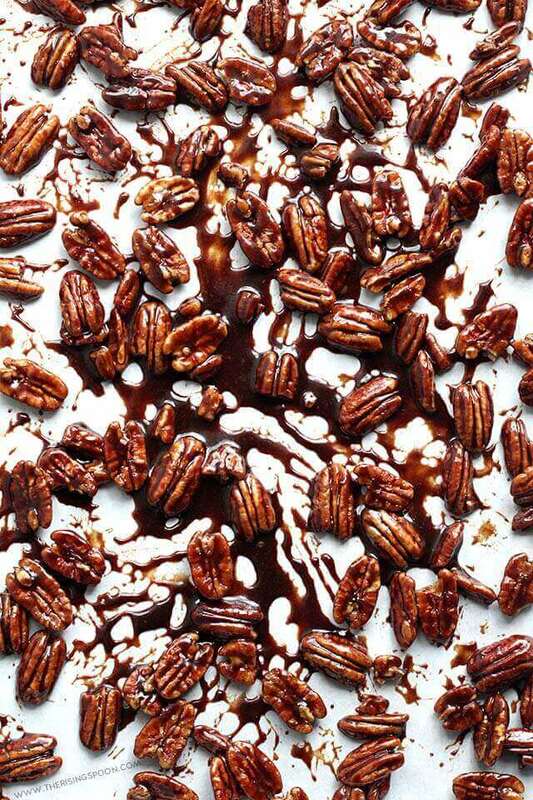 When all (or most) of the sugar mixture has reduced so it's clinging to the pecans (use your nose as a guide to make sure it's not burning), remove from the heat and immediately pour the nuts onto the parchment lined sheet. Quickly spread the nuts in one even layer and separate them so they don't stick together. 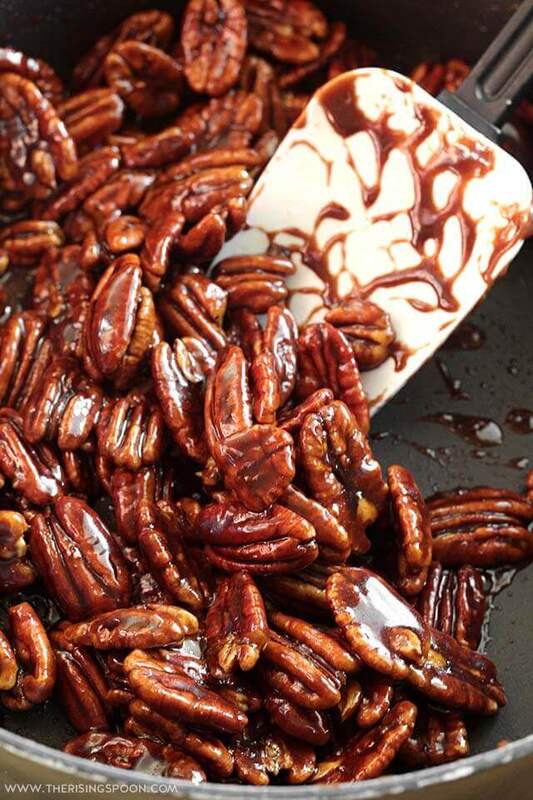 Let the pecans cool completely (they will firm up quickly) then store in an airtight container on the counter. Consume within 3-4 days for the best taste & texture; however, if crystallization doesn't bother you they'll last up to two weeks. 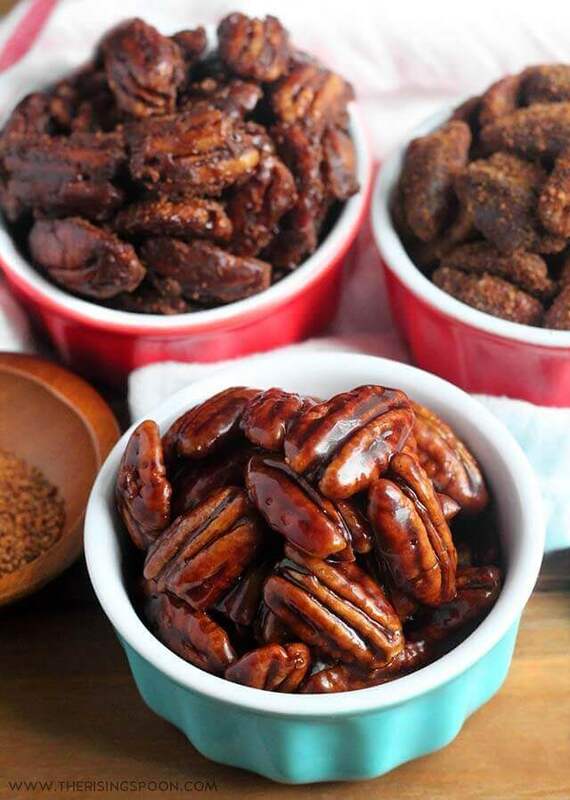 If you prefer a sweeter candied nut or want to cover up the slightly sticky caramel-like coating, you can toss the cooked pecans in an additional 1/4 cup of coconut sugar (maple sugar would be a good substitute) + 1/2 teaspoon of cinnamon powder. Either dump the nuts straight from the skillet into a bowl with the extra sugar (these make the outsides craggy) OR wait until they're cool and toss them then (the outsides will have an even layer of sugar). See the picture above in the blog post for visual reference.